Izabella's Tattered Letters: Art Collaborative "Color of Hope"
Art Collaborative "Color of Hope"
Lynne Perrella has asked to spread the word~ 2 days left~ ending Wednesday on Ebay~ it is up to almost $900.00! 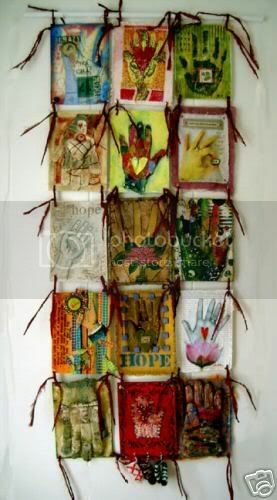 Color of Hope ~ Art Collaborative wall hanging to benefit American Red Cross for hurricane relief. In the listing it says Teesha Moore is in it, but as I understand she is not, she had to back out at the last moment.